"Every summer we have a 4th of July party. There are several dishes that our guests look forward to eating. This is one that makes everyone say Aaaaah, the corn salad..."
Grill corn on preheated grill until husks are charred on all sides, about 20 minutes. Remove corn from grill and allow to cool. Remove husks and silk from corn, then cut corn kernels from the cob. 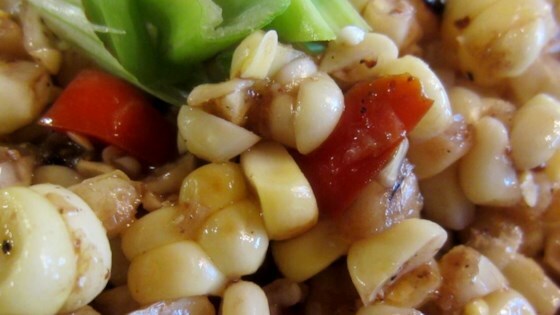 Toss corn kernels, celery, green bell pepper, onion, and pimento peppers together in a large bowl. Whisk olive oil, balsamic vinegar, sea salt, Dijon mustard, sugar, and black pepper together in a bowl. Pour dressing into the corn mixture and toss well. Cover and refrigerate for at least 12 hours and up to 3 days before serving. This was very good. This makes a lot of salad - way more than 6 servings I would estimate.